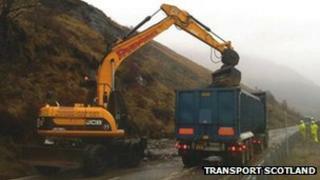 The Rest and Be Thankful section of the A83 in Argyll has re-opened after being closed by a landslide. Contractors were brought in on Monday to clear 100-150 tons of debris, washed down the hillside by heavy rain. Long diversions, adding up to 50 miles to some journeys, were in place during the clearing operation. This was the sixth time in five years falling debris has closed the road. An emergency route along the nearby old military road is set to be built soon. A spokesman for Transport Scotland said: "Following a landslip this morning at the Rest and Be Thankful, and a clean up operation of around 150 tonnes of debris which forced the closure of the road, the A83 has now reopened. "In addition, the Multi-Agency Response Team partners also met this morning to discuss the impact of today's weather on the transport network, including the circumstances at the Rest and Be Thankful. "All available resources were made available to help deal with the situation and get the road reopened as soon as practicably possible." A taskforce led by the Scottish government, Transport Scotland and Argyll and Bute Council has been meeting this year to find a permanent solution to the landslip problem. Top of the list is the £1.5 emergency diversion route. Argyll and Bute Council leader Roddy McCuish said he was "hugely disappointed" that the Scottish government had not delivered the diversion route, as initially hoped, by November. He said: "It has now been promised this will be in place by the end of January, but how many more times will Argyll and Bute be effectively cut off before then? "We need a permanent fail safe solution to keep the A83 open at the Rest and Be Thankful so Argyll and Bute can carry on as normal even when bad weather hits the area." "Our businesses and people living here suffer every time the main route into Argyll and Bute is closed." The Transport Scotland spokesman said the agency was "acutely aware of the views of the communities across Argyll to keep the A83 open for business". He added: "More generally, we continue to make good progress on work to construct an alternative route on the old military road, with work carrying on today despite the conditions, and we were pleased to sign a formal agreement last week with the owner of a section of private land which has allowed us to press ahead with work on this vital project. "The A83 faskforce is also scheduled to meet in the next few weeks and we look forward to bringing members up to speed on developments then."